I wonder if we all have things that we don’t like but we keep, because we can’t bear to throw them away? Things that we never would have bought, that don’t go with anything else in the house, things we don’t even like. I have the Toby Jug. 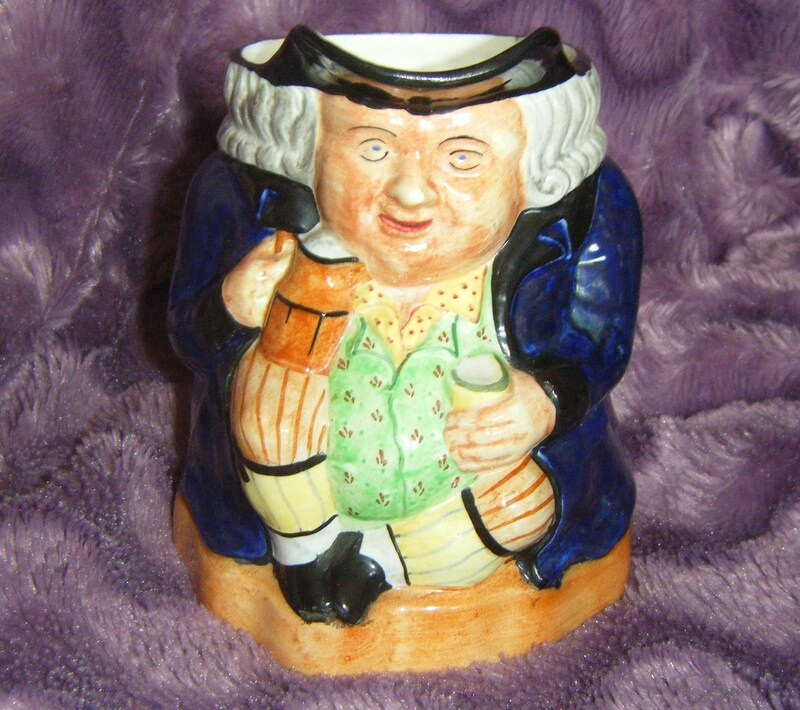 I grew up with the Toby Jug on the mantelpiece, staring at me. I never liked it, it struck me as a little creepy. It could hold things, but I don’t remember anything being kept in it. Dust collects in the bottom and it’s hard to clean. It scares me. But I can’t possible get rid of it, it belonged to my parents. I believe it was a wedding present to them, I have no idea if it holds any value, I don’t really care. Because even if it is valuable, I couldn’t sell it. I feel I have to keep it. When I moved into my present home around five years ago I managed to not quite unpack it. I popped it into a kitchen cupboard, shut the door and that is where it has stayed. I hardly ever open that cupboard, it’s got things in it I don’t often use; a gravy boat with seagulls on, a toast rack in the shape of the seven dwarfs, egg cups and cups and saucers. Here it is, what do you think? It isn’t even as if I have particular happy memories associated with it, I’m not sure my parents even liked it. But it was always there. I got it out to take the photographs and noticed it had a mark on the bottom so I googled it. 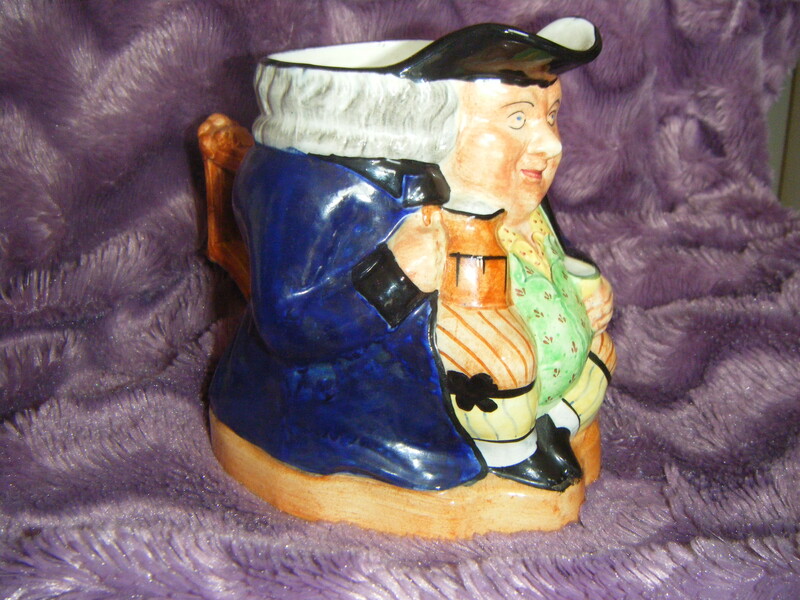 I found it was made by Kirkham Pottery in Stoke, England between 1946 – 1961 (which fits with my parents marriage in 1949). And then I put it back in the kitchen cupboard. Are these water pitcher size or are you talking about Toby Mugs, which were to drink out of? I think I see the pour spout, so it must be the JUG! Hi, silly me! I forgot to put in anything about the size or to include something in the photo that would give a clue! It’s about as tall as my hand! I refuse to get it out of the cupboard again to measure it exactly! Hi Rick, I use WordPress.com, there’s a Dashboard on the left hand side, I just used the ‘Academica’ theme from the list under ‘Appearance’. Then I looked under ‘Appearance’ and ‘Widgets’ and tried a few out to see what it looked like. I didn’t know anything about blog design before I began and found it easy to use, as well as fun as I chopped and changed the look of it. There are instructions which make it easy to progress one thing at a time, but sometimes it’s fun to just dive in and try it out for yourself! Good luck.